I went to Linz with my brother Michael when I was around 16, he was on Erasmus in Austria and I went over to visit for a few days. I don’t remember much about the city apart from that they claimed to have the 2nd best Döner Kebab outside of Turkey…. to be honest it wasn’t all that. 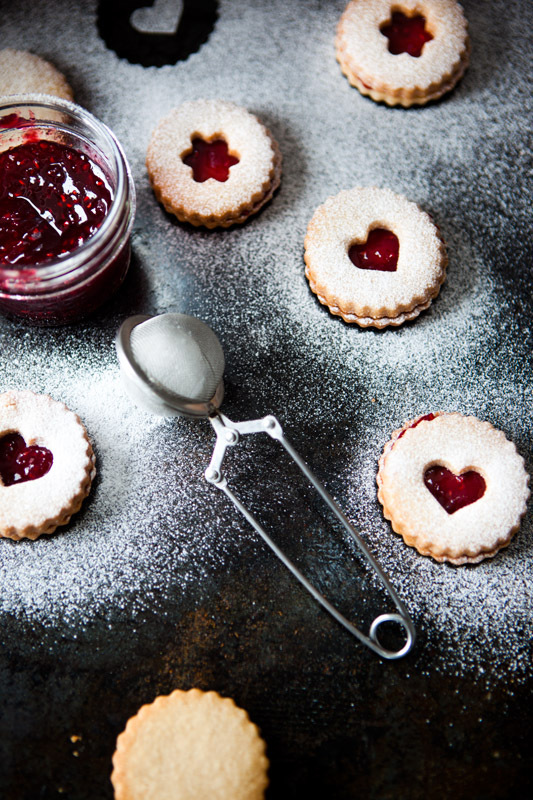 Linzer biscuits have a similar base to the Linzer Torte, the dough is quite close and are filled with some kind of jam or preserve…. what a jammy delight. I love these little pretty cookies quite a lot. They have quite a buttery taste from the biscuit with a perfect addition of cinnamon and when they’re wedged between some good quality jam it’s hard not to eat more than the one. 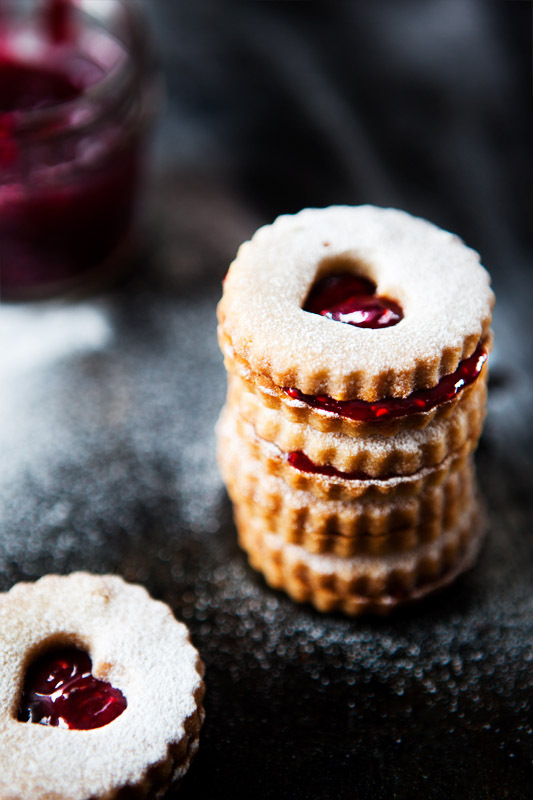 To make the Linzer cookies you generally need two types of cookie cutters, one that is circular and fluted (or not, doesn’t matter) and a smaller cutter to take out the centre part. Usually people use a heart shape or a plain circle but they can be hard to find that small sometimes. On the other hand you could save the hassle and get a Linzer cookie cutter set, which is what I did. 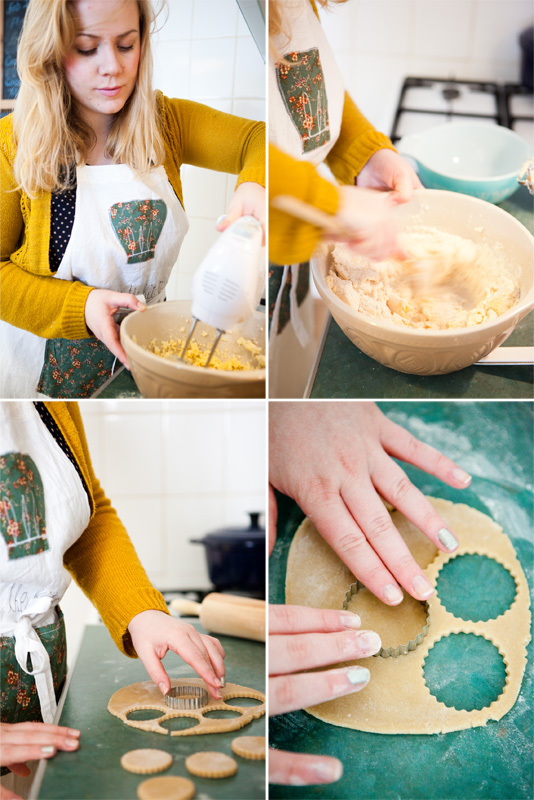 It also came with a handy recipe, which is perfect and this recipe is adapted from that. In small bowl, combine flour, almonds, salt and cinnamon; set aside. In large bowl, beat together the butter and sugar with an electric mixer until light and fluffy. Add egg and vanilla; mix well. Add flour mixture; mix only until incorporated. Divide dough onto 2 pieces; press into small disks, about 1 inch thick. Wrap separately in plastic wrap and refrigerate 2 hours or until firm enough to roll. Preheat oven to 175°C. On a floured surface, roll out one disc of dough 1/8 inch thick (keep remaining dough chilled). Cut half of the dough using a round cutter (this will be the bottom cookie) With half of the cookies cut a smaller shape in the middle of the cookie (this will be the top cookie) Transfer to parchment paper lined baking sheets. Dough scraps can be formed into a disk, chilled for at least 30 minutes and re-rolled. Always make sure dough is firm and chilled before cutting or else they will lose shape in the oven. Bake for 10-12 mins or until light golden brown. Let cool on the cookie sheet for about 2 minutes; remove from sheet and cool completely. 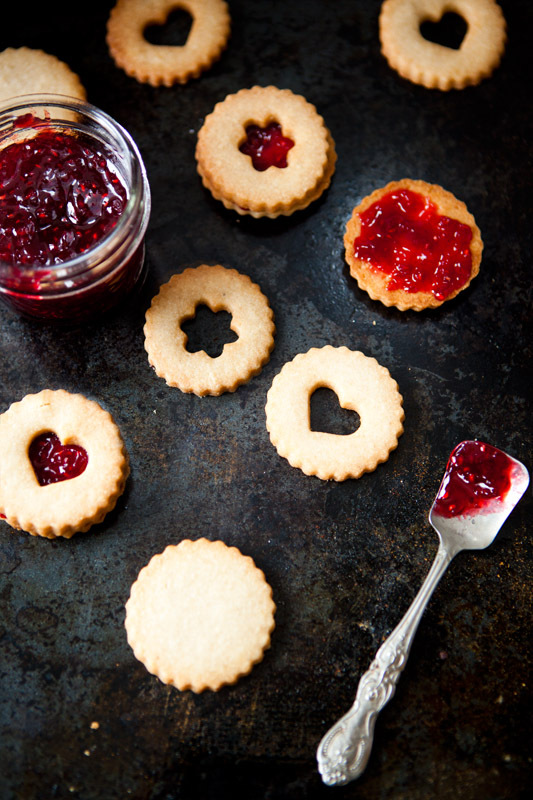 Spread about a teaspoon of jam onto the bottom of the cookie and sandwich with a top cookie (one with centre cut out). Then finish off by dusting cookies with icing sugar. Really pretty, i love the heart shaped ones… nice nails too! could you please give cups and measurements instead of grams. The cookies are beautiful and perfect for the holidays. Thank you. Sorry, but I use European measurements, it’s quite easy to convert online. Great detail and they look fab….any chance we can buy any? Lovely, look great in this!! Love those cookies, your looking as good as they are ,and I do like your apron cookie fox. great photos looks good enough to eat, have to give them a go now. looks great! but, uh, how much sugar? I saw your biscuits on foodgawker and just had to see the rest of your blog. Your photography is stunning! About to try them for a Xmas cookie exchange! How many cookies does this recipe make? Thanks! Would they still come out okay if don’t include the almonds? Well you would have to change the flour ratio more than likely..but give them a whirl if you really cant get ground almonds. what exactly should i do if i cut out the almonds? hi svitlana, I’ve never tried it without but you could try and just replace it with flour, let me know how it turns out. Hello there, do you know why jam would seep into my cookie and color it in the center? I used different kinds of jams and they all do it, what could be a problem? The recipe forgot the salt.